For the Fiat model of the same name, see Fiat Dino. For the 1958 Formula One car, see Ferrari 246 Dino. Dino (Italian pronunciation: [ˈdiːno]) was a marque for mid-engined, rear-drive sports cars produced by Ferrari from 1968 to 1976. 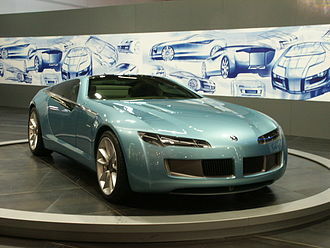 Used for models with engines with fewer than 12 cylinders, it was an attempt by the company to offer a relatively low-cost sports car. 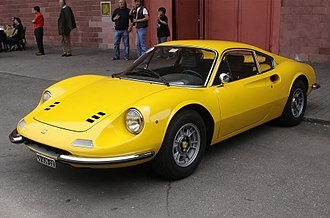 The Ferrari name remained reserved for its premium V-12 and flat 12 models until 1976, when "Dino" was retired in favour of full Ferrari branding. Named to honour Ferrari founder Enzo Ferrari's son and heir Dino Ferrari, the Dino models used Ferrari racing naming designation of displacement and cylinder count with two digits for the size of the engine in deciliters and the third digit to represent the number of cylinders, i.e. 246 being a 2.4-litre 6-cylinder and 308 being a 3.0-litre 8-cylinder. 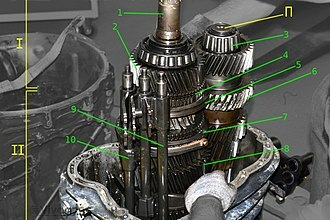 Ferrari street models of the time used a three-digit representation of the displacement in cubic centimeters of one of the 12 cylinders, which would have been meaningless in a brand with differing numbers of cylinders. The "Dino" marque was created to market a lower priced, "affordable" sports car capable of taking on the Porsche 911. Ferrari's expensive V12s well exceeded the 911 in both performance and price. 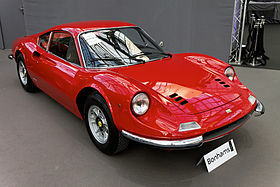 Enzo Ferrari did not want to diminish his exclusive brand with a cheaper car, so the "Dino" was created. 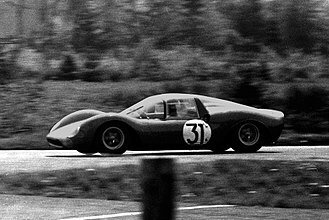 The name "Dino" honors the founder's late son, Alfredo "Dino" Ferrari, credited with designing the V6 engine used in the car. Along with engineer Vittorio Jano, Dino persuaded his father to produce a line of racing cars in the 1950s with V6 and V8 engines. Ferrari wished to race in the new Formula Two category in 1967 with the Dino V6 engine. However, the company could not meet the homologation rules, which called for 500 production vehicles using the engine to be produced. Enzo Ferrari therefore asked Fiat to co-produce a sports car using the V6, and the front-engined, rear-drive Fiat Dino was born. 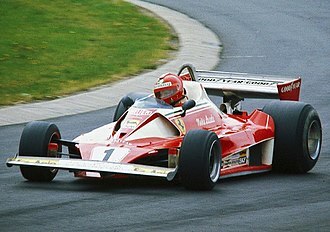 It used a 1,987 cc (121.3 cu in) version of the Dino V6, allowing Ferrari to compete in Formula Two. Although a mid-engine layout was common in the world of sports car racing at the time, adapting it to a production car was quite daring. 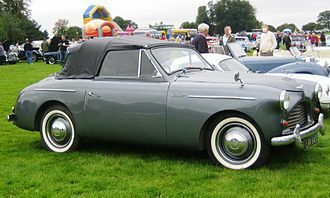 Such a design placed more of the car's weight over the driven wheels, and allowed for a streamlined nose, but led to a cramped passenger compartment and more challenging handling. Lamborghini created a stir in 1966 with its mid-engined Miura, but Enzo Ferrari felt a mid-engine Ferrari would be unsafe in the hands of his customers. Eventually he partially relented, and allowed designer Sergio Pininfarina to build a mid-engined concept car for the 1965 Paris Motor Show under the Dino badge alone. The 206S, shown at Turin in 1966, bore an even closer resemblance to the production version. 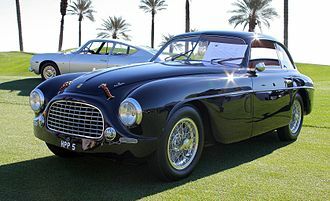 Response to the radically styled car was positive, so Ferrari allowed it to go into production, rationalizing the lower power of the V6 engine would result in a more manageable car. The first road-going Dino as well as the first Ferrari-built road car was the 1968 Dino 206 GT, designed by Leonardo Fioravanti at Pininfarina. 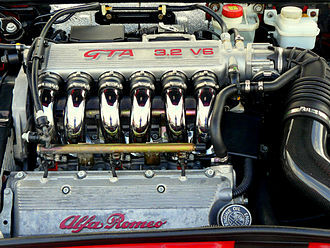 The 206 GT used a transverse-mounted 2.0 L all-aluminium 65-degree V6 engine, with 180 PS (132 kW; 178 hp) at 8,000 rpm, the same used in the Fiat Dino. The 206 GT frame featured an aluminium body, full independent suspension, and all round disc brakes. 152 were built in total during 1968 and 1969, in left hand drive only. In 1969 the 206 GT was superseded by the more powerful Dino 246 GT. The 246 GT was powered by an enlarged 2418 cc V6 engine, producing with 195 PS (143 kW; 192 hp) at 7,600 rpm in European specification. Initially available as a fixed-top GT coupé, a targa topped GTS was also offered after 1971. 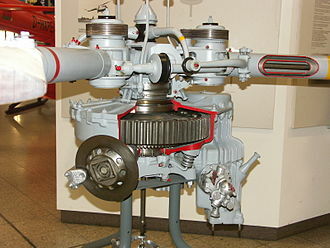 The 308 was a 2+2 with a wheelbase of 100.4 inches (2,550 mm). The 308 was designed by Bertone; with its angular wedge shape, it looked quite different from the 206/246 from which it was derived. 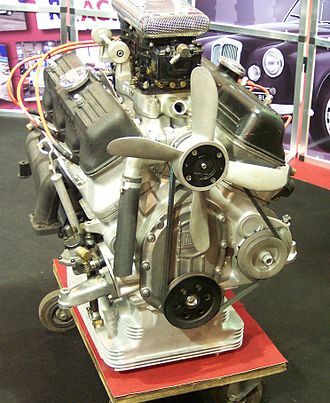 The 308 GT4 V-8 had a 90-degree, dual-overhead-camshaft, 2927 cc motor with 4 Weber carburetors which produced 250 hp (186 kW). 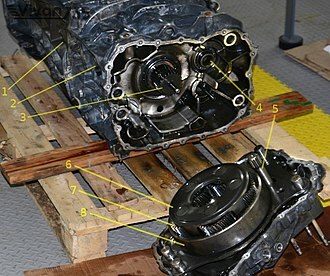 The V-8 block and heads were made of an aluminum alloy. The compression ratio was 8.8:1. 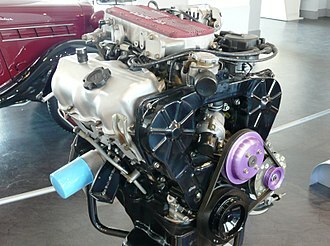 The American version had a timing change and an air-pump; it produced a modest 230 hp (172 kW). 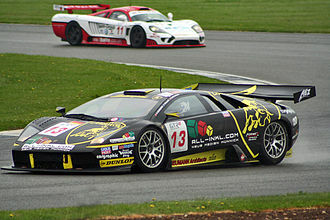 The GT4 weighed 2535 pounds. The 308 GT4 wore the Dino badge until May 1976, when it finally got the Ferrari "Prancing Horse" badge on the hood, wheels, and the steering wheel. 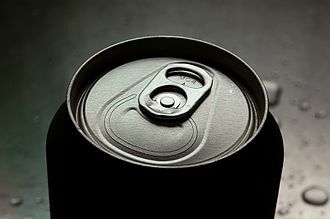 ^ Tyer, Ben. "Ferrari Dino 206 GT". Hampshire, UK: QV500.com. Archived from the original on 2016-04-04. Gabriel, Jean-Pierre (2003). 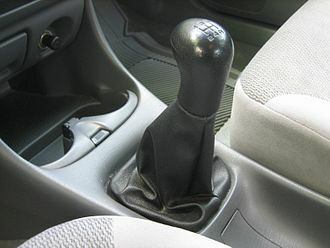 Les Ferrari de Turin. Nîmes: Editions du Palmier. ISBN 2-914920-25-3. 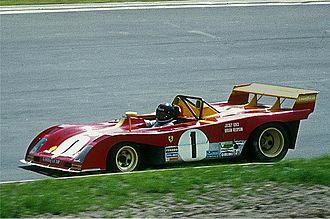 Wikimedia Commons has media related to Ferrari Dino. The Lamborghini Miura is a sports car produced by Italian automaker Lamborghini between 1966 and 1973. 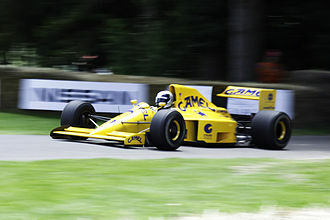 The car pioneered the mid-engined two-seat layout, the standard for high-performance sports, when released, it was the fastest production road car made. The Miuras rolling chassis was presented at the 1965 Turin auto show, and it received stellar receptions from showgoers and the motoring press alike, each impressed by Marcello Gandinis sleek styling and the cars revolutionary mid-engine design. Lamborghinis flagship, the Miura received periodic updates and remained in production until 1973, a year the extreme Countach entered the companys lineup, amid tumultuous financial times for the company. During 1965, Lamborghinis three top engineers, Gian Paolo Dallara, Paolo Stanzani and Bob Wallace put their own time into developing a car known as the P400. The engineers envisioned a road car with racing pedigree, one which could win on the track, the three men worked on its design at night, hoping to convince company founder Ferruccio Lamborghini such a vehicle would neither be too expensive nor distract from the companys focus. When finally brought aboard, Lamborghini gave his engineers a free hand in the belief the P400 was a valuable marketing tool. 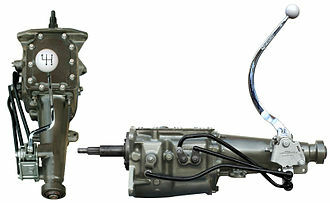 The car featured a transversely-mounted mid-engine layout, a departure from previous Lamborghini cars, the V12 was unusual in that it was effectively merged with the transmission and differential, reflecting a lack of space in the tightly-wrapped design. 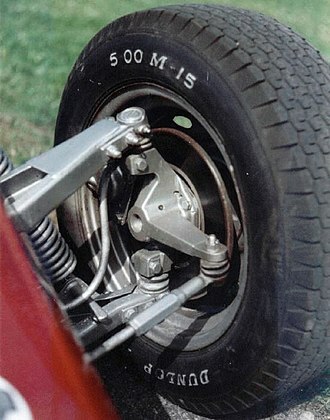 The rolling chassis was displayed at the Turin Salon in 1965, impressed showgoers placed orders for the car despite the lack of a body to go over the chassis. Bertone was placed in charge of styling the prototype, which was finished just days before its debut at the 1966 Geneva motor show, none of the engineers had found time to check if the engine fit inside its compartment. Committed to showing the car, they decided to fill the bay with ballast and keep the hood locked throughout the show. Sales head Sgarzi was forced to turn away members of the press who wanted to see the P400s power plant. Despite this setback, the car was the highlight of the show, the favourable reaction at Geneva meant the P400 was to go into production by the following year. Marcello Gandini is an Italian car designer, known for his work with the automotive design house Gruppo Bertone, including his design of the Lamborghini Countach. Gandini belongs to a triumvirate, along with Giorgetto Giugiaro and Leonardo Fioravanti, of noted Italian car designers, all born in 1938, Gandini was one of twenty-five designers nominated for Car Designer of the Century. The son of a conductor, Gandini was born in Turin. 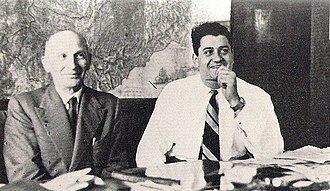 In 1963, he approached Nuccio Bertone, head of the Gruppo Bertone company for work, however Giorgetto Giugiaro, Bertones chief designer, opposed him being hired. When Giugiaro left Bertone two years later, Gandini was hired, and worked for the company for fourteen years, creator of Stile Bertone in Caprie, Gandini served as general manager of the styling house, designing show cars as well as managing the construction of prototype automobiles. Gandini designed Lamborghinis Miura and Countach and many cars as well, including the Citroën BX, the first-generation BMW5 series, the Innocenti Mini.